I have been remiss in posting about one of the best parts of spring - the eruption of the earliest spring wildflowers. There are many signs of winter's thaw each year, but none pronounce the passing of cold and ice and the onset of spring as enthusiastically as do colorful wildflowers. Each year, or nearly so, I make a peregrination to a few special hotspots in Adams County, to steep bluffs that overlook the Ohio River. Here, spring arrives far earlier than it does to points even a few miles away - far earlier than northern lands such as Columbus, or Cleveland. 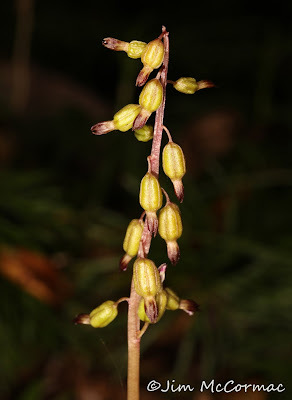 So, on March 5 I made the trek southward, and was rewarded by the spectacle of a dozen or so wildflower species peeking from the ground - the first scouts in what will later become a botanical avalanche of flora. 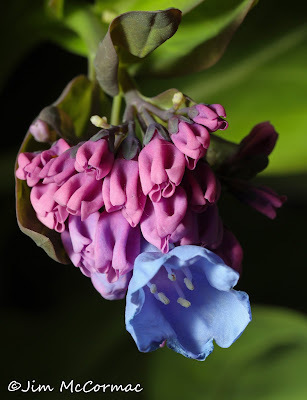 Virginia Bluebells, Mertensia virginica, were just starting to unfurl. One might argue that newly emerged plants, such as this one, are the showiest. The pink buds are punctuated by the first bright blue flowers. By now, this expansive hillside will be covered with acres of flowering bluebells. One of our first "wildflowers", and one of the easiest to pass by, is the female flowers of American Hazelnut, Corylus americana, a shrub. 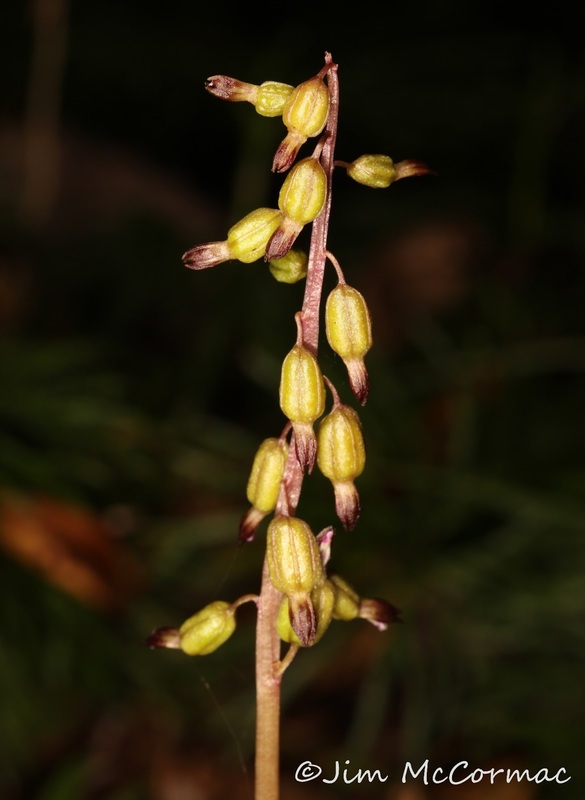 The dangling yellowish spikes of male flowers are far easier to spot, and when one does, all that is necessary is to move in close and inspect nearby terminal branch tips. 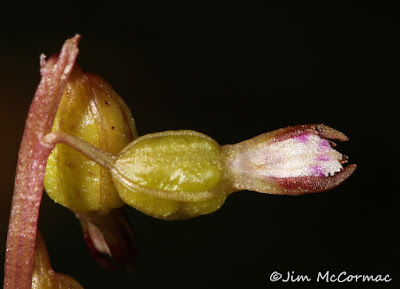 The bright scarlet flowers may be tiny, but are quite showy upon close examination. Harbinger-of-spring, Erigenia bulbosa, had burst forth in great profusion even on this early date. It was everywhere I looked, and one notable wooded floodplain sported many hundreds if not thousands of the elfin parsleys. 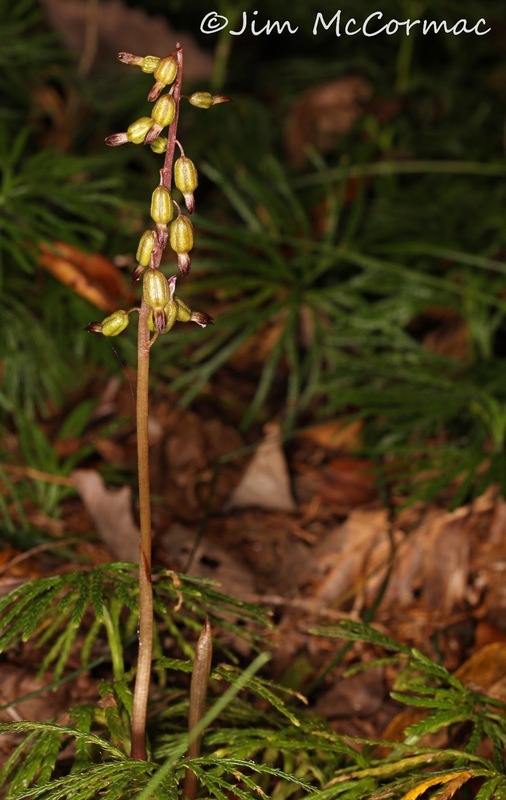 A whopper plant might tower only two inches or so off the forest floor, and some plants remain concealed by leaf litter. Snow Trillium, Trillium nivale, always a crowd-pleaser and a plant that I make an effort to see each spring. 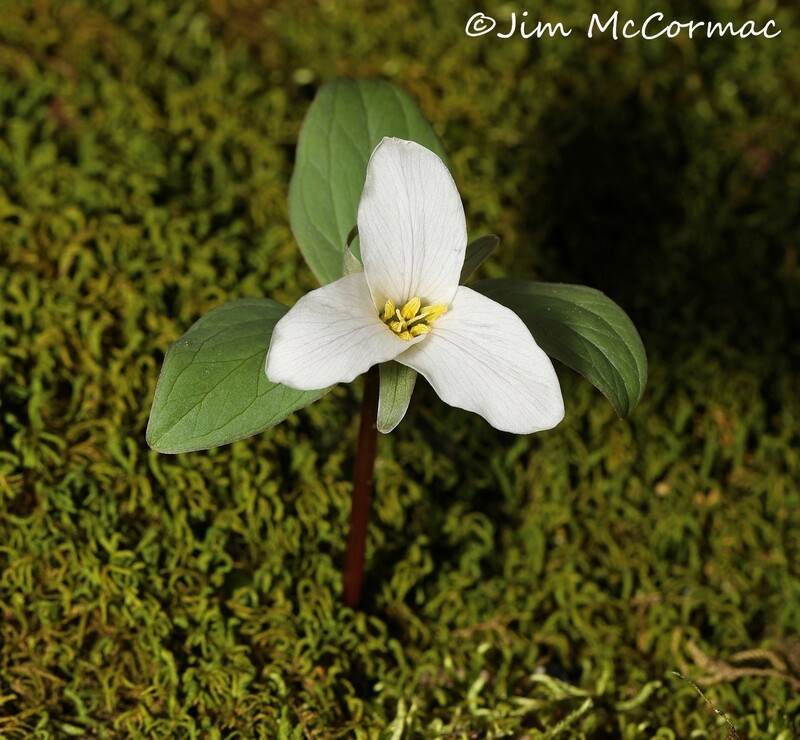 This little lily - smallest of the eight Ohio Trillium species - is also the first to bloom. 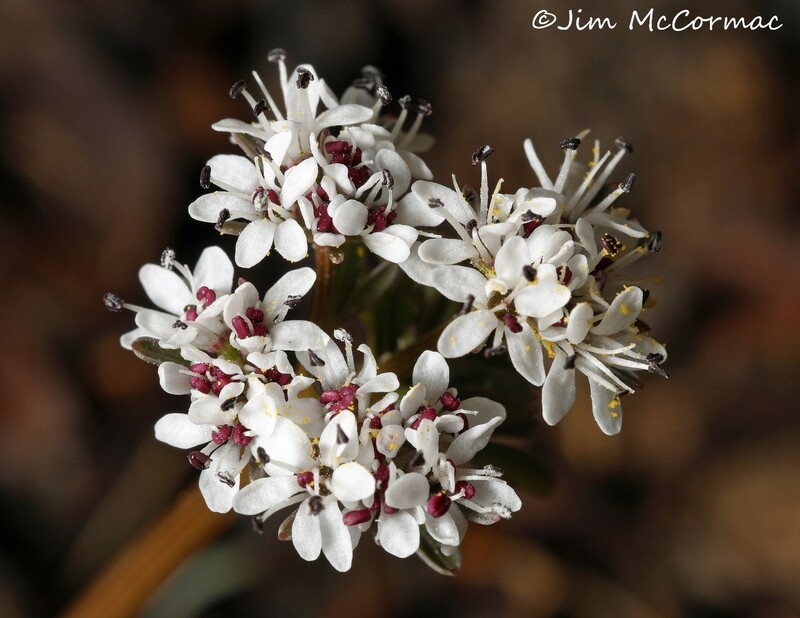 It's common name is apt - flowering plants are routinely blanketed by early spring snowfalls. 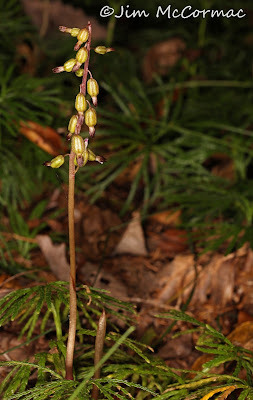 This individual had the good manners to grow alone on a rich bed of moss, making for good photographic fodder. 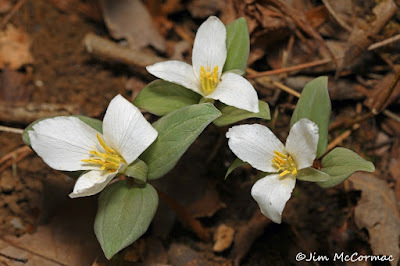 The Adams County honey-hole where I photographed these Snow Trillium is in the midst of a boom year. More plants than I ever recall seeing there were shooting forth, and the population still had a ways to go before reaching peak bloom. Many thousands of plants occur here - the biggest population of Snow Trillium in Ohio, and probably one of the largest anywhere. 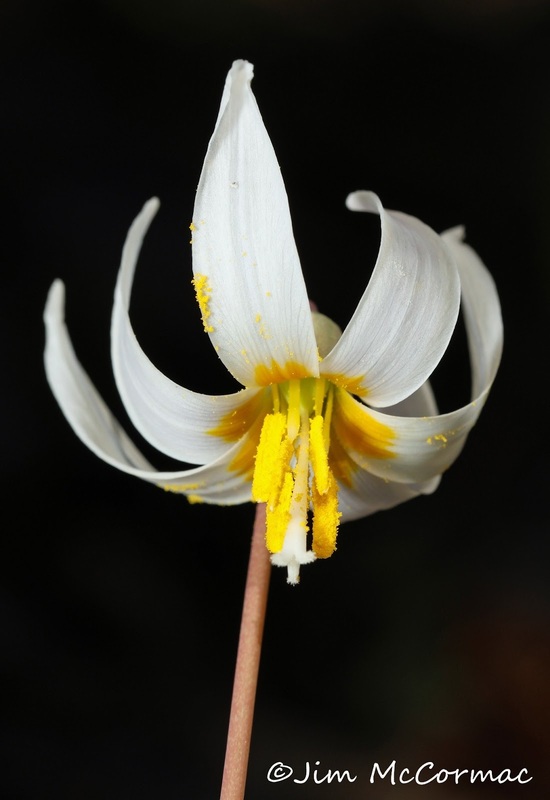 Hardy White Trout Lilies, Erythronium albidum, were flowering in numbers most everywhere. These graceful lily is always one of the very first wildflowers to pop up. As is always the case with small plants, the photographer must go prostrate to present them well. I had my head pressed into the forest humus to get an upward angle of the gorgeous six-petaled flower, which is only held 6-8 inches aloft on its bare flesh-colored peduncle. By now, far more spring wildflowers will have sprung forth, and they'll reach a climax in southern Ohio in mid-April or so. I'll hope to get back down there before long, and shoot some more of them. On Independence Day in 1972, Harold von Braunhut was awarded a patent for "Sea-Monkeys." They already had become the stuff of legend; he had been selling the seemingly magical creatures under that name for a decade. One need only buy a packet of eggs, add water and voila, soon Sea-Monkeys will be swimming around the aquarium. They are actually a type of brine shrimp, and the eggs are in a state of cryptobiosis, a dormancy broken by moisture. A wild Ohio counterpart of Sea-Monkeys are fairy shrimp. These small crustaceans also burst to life when they hit water, but their aquariums are vernal pools. Vernal pools are small, highly specialized wetlands that normally only hold water seasonally. Fueled by snowmelt and spring rains, they peak from late February into May and have largely dried out by summer's onset. During their brief saturation, vernal pools become nurseries for an astonishing array of life. You'll often hear the pool before you see it, courtesy of the cacophony created by spring peepers and western chorus frogs. Early-season warm rains send armies of salamanders marching to the ponds. There, large congresses of the amphibians writhe in a short-lived mating frenzy, leaving their spawn to develop in the pools. Massive, predatory diving beetles scoot through the water, seizing small animal prey. Casemaker caddisflies trundle along, wearing ghillie suits of twigs. Gorgeous wood ducks stop to feast on the bounty, whistling high-pitched squeals when flushed. Arguably the most interesting organisms are the fairy shrimp. These inch-long creatures are confined to vernal pools and adulthood lasts only two months or so. I recently was shown a beautiful vernal pool in Zaleski State Forest in Vinton County by biologist Laura Hughes. Our visit occurred after nightfall, the better to see salamander activity. Upon shining our lights into the water, we noticed scads of fairy shrimp wafting about. The creatures had recently emerged, their eggs having lain dormant in the pool's muck for the past ten months. Like the Sea-Monkeys, the addition of water to the vernal pool had awoken them from their embryonic slumber. 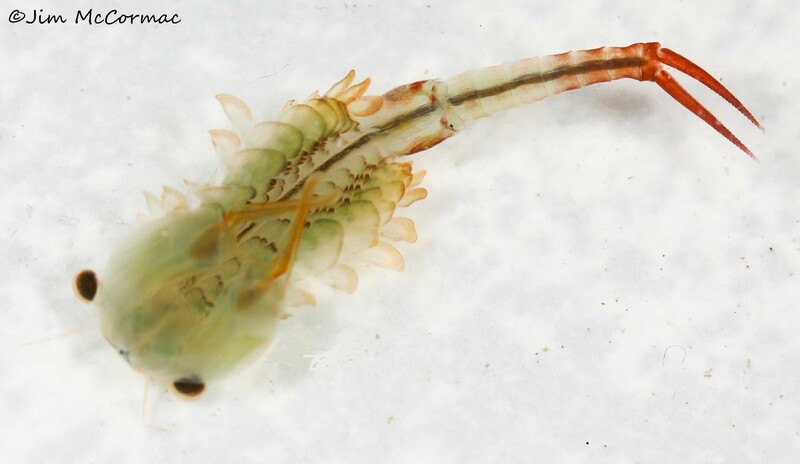 Delicate and graceful, the shrimp are powered by eleven pairs of feathery legs. When alarmed, the animals dart away with a rapid burst of speed. They, like other life-forms drawn to the pool, are there primarily to reproduce. Plankton and other tiny organic matter fuel them. Soon after mating, the female develops up to 150 hard, cystlike eggs. These are visible through a translucent pouch on her midsection. When released, the eggs fall into detritus on the pool's bottom. They can withstand drought, extreme cold and heat. The next spring, the eggs will release larval shrimp to begin the cycle anew. Since colonization by Europeans, Ohio has lost about 90 percent of its wetlands. Vernal pools have been hard-hit. Their small size and isolated distribution make them especially vulnerable to development. Vernal pools are treasure troves of fascinating biological diversity and those that remain should be protected at all costs. I'm giving a program next Wednesday evening at the Happy Days Lodge in the Cuyahoga Valley National Park, for the Cuyahoga Valley Photographic Society. This is on the north side of Akron, and not too far south of Cleveland. Show begins at 7 pm, it's free, and all are welcome. The talk is a photo-rich ramble entitled " A Romp Through Ohio's Flora and Fauna", which showcases the great natural diversity of our state, and features both well known and nearly unknown organisms. With an overarching message of conservation, of course. I've only given this talk once, but it seemed to go over well, and I look forward to running through it again - probably with some updated material. Details can be found RIGHT HERE. 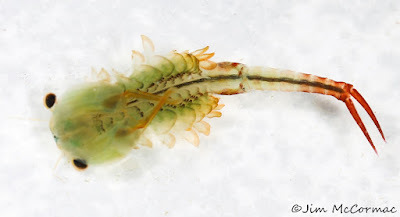 A male Fairy Shrimp, Eubranchipus vernalis, one of the stranger inhabitants of eastern vernal pools. Last night was reasonably warm and rainy - a perfect night to seek salamanders and other early breeding amphibians. So, I joined Laura Hughes to head to southeastern Ohio and interesting amphibian habitats. We were specifically seeking the rare (for Ohio) Eastern Spadefoot Toad, but no luck on that. We think it's probably still a bit early for the toad, but will be back to try again. Laura knew of a fabulous vernal pool in the nearby Zaleski State Forest, and off we went to have a look. Immediately upon wading in, we saw scads and scads of Eastern Fairy Shrimp, such as above. These are amazing little creatures that are obligate denizens of vernal pools. By capturing some and placing them in small containers with clear water, I was able to make some images. As it was raining pretty hard nearly the entire time we were at the pool, I wasn't going to take my camera rig out in the field - I've learned this lesson the hard way. The shrimp were photographed under the refuge of my Jeep's back tailgate, then returned to the pool. We were really hoping for salamanders, and weren't disappointed. There weren't many, but we saw a dozen or so Spotted Salamanders, Ambystoma maculatum. All appeared to be male, and some were already leaving the pond, marching overland away from the water. While some egg masses were already in the vernal pool, it didn't appear that the bulk of salamander activity had yet occurred. 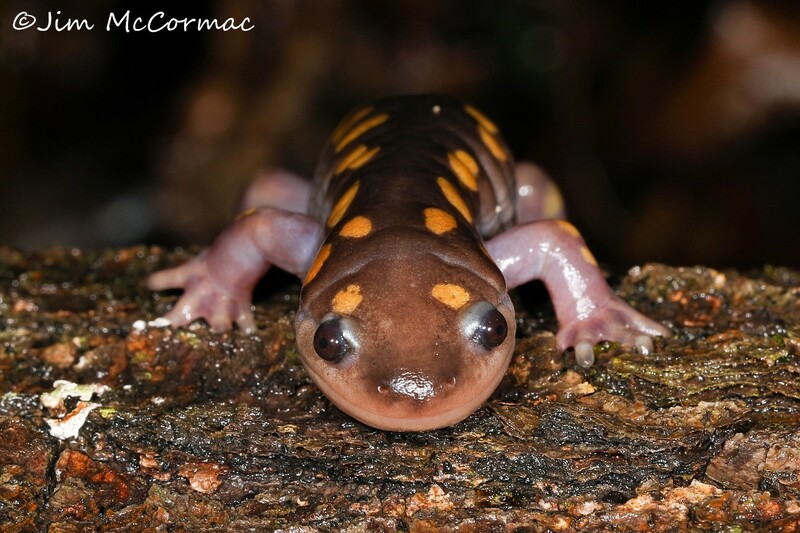 So, if you are hoping to seek some salamanders yet this year - at least the vernal pool-breeding mole salamanders - there's still time. Signs of spring start materializing come mid-February, especially in mild winters like this one. Our first "wildflower," skunk cabbage, bursts from spring-fed mires. 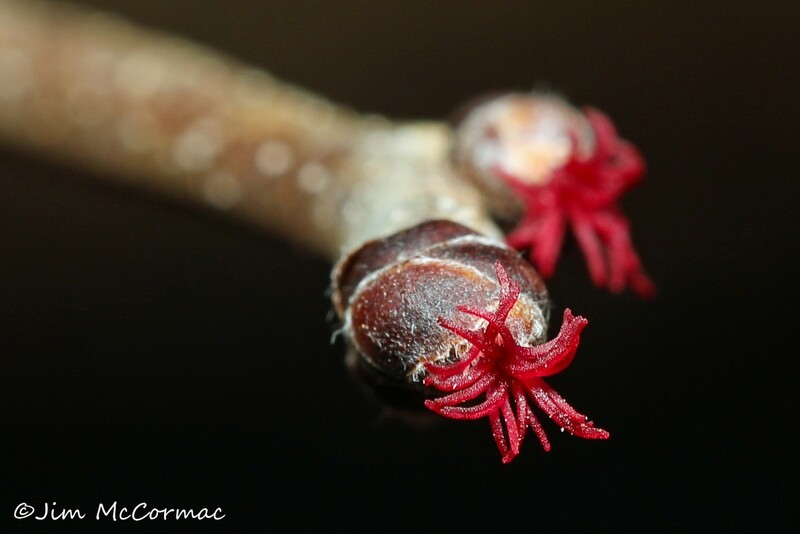 Buds begin to pop on elms and maples. The earliest bees and flies appear, ready to tap nectar from pioneering spring flowers, such as harbinger-of-spring. Skunks become active, as your nose might have told you. And early birds become obvious: turkey vultures soaring overhead, killdeer yelling in the fields, and red-winged blackbirds teed up on shrubs. As Mark Twain said, "It's spring fever. That is what the name of it is." And nothing expresses the testosterone-fueled vernal rush of hormones like male ducks. By this time of year, drakes are busily courting seemingly oblivious hens. I recently visited a local patch new to me: Char-Mar Ridge Park, part of the Preservation Parks of Delaware County holdings. The centerpiece of the 128-acre property is a beautiful pond backed up by an aging dam. Anchored to the south shore is an excellent blind, or "hide" as the Brits would say. Upon cresting the rise and spying the small lake, I saw a dozen hooded mergansers at the far end. Ducking into the blind and out of sight, I didn't have to wait long for the ducks to swim my way. 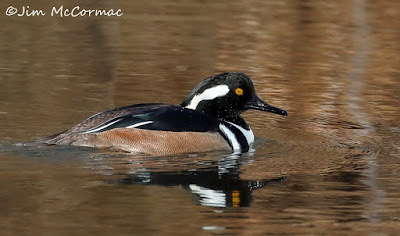 You might still be missing a vital part of Gaea if you've never clapped eyes on a drake hooded merganser. What it lacks in size is more than compensated for with its feathered finery. Vermiculated beige flanks are capped by a back and head of the deepest ebony. A snowy bib bordered by white slashes punctuates the sooty breast. Topaz eyes stare inscrutably above a thin, sharply serrated bill — good for snaring slippery aquatic prey. Best of all, though, is the bird's crest. In repose, the merganser appears coiffed with a white, slicked-back mullet. But when aroused, he flips his topknot erect like a geisha's fan, completely transforming his look. The hens are, by comparison, brown and drab. They do sport a shaggy topknot that would make a punk rocker proud. 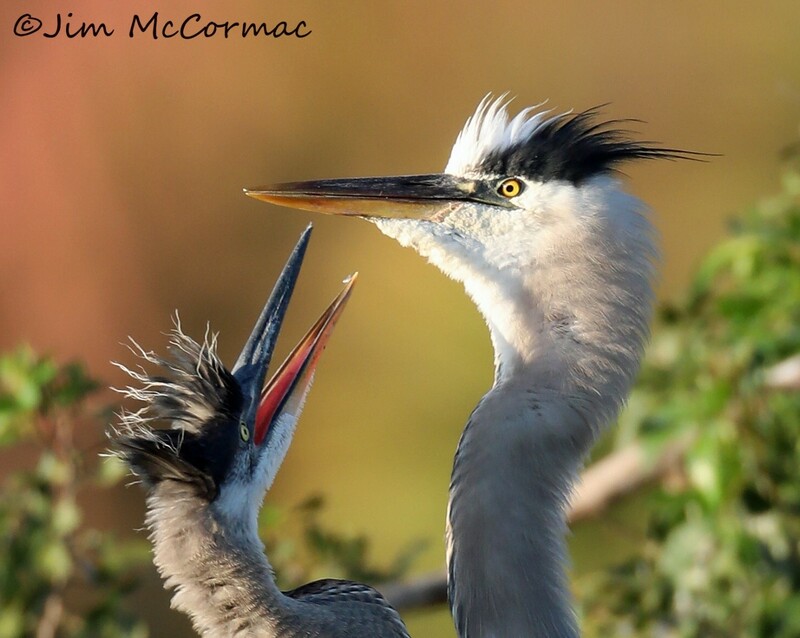 When the drakes come a courting, the females play coy and act uninterested. The studs let it rip, fanning crests and pumping heads, throwing their bills skyward while emitting weird burping groans. These are the steps that must be taken to make little hooded mergansers. And it can only be a good thing that there are ever more hooded mergansers, at least in this region. 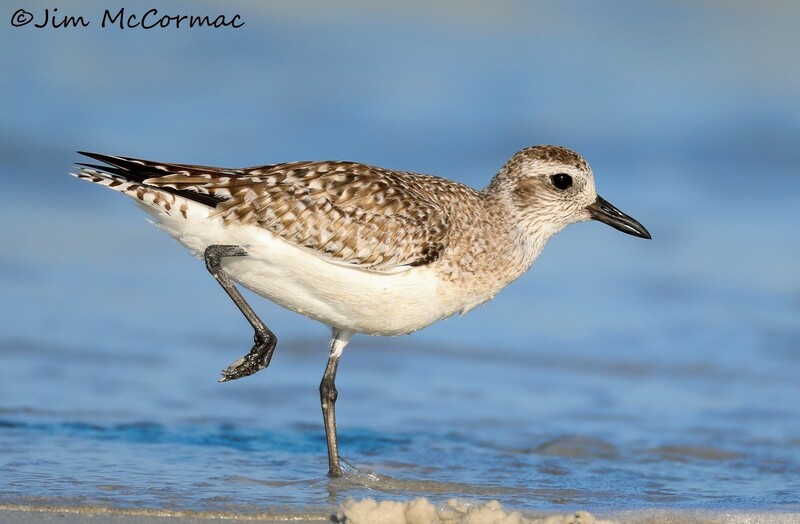 The first Ohio Breeding Bird Atlas was conducted from 1982 to 1987. 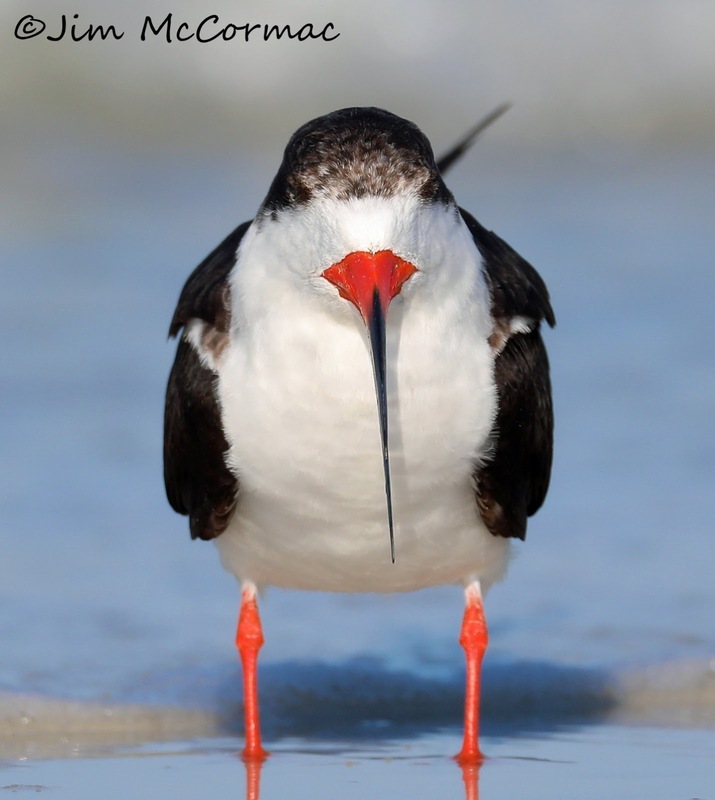 Breeding Bird Atlas II ran from 2006 to 2011. Hooded mergansers increased by 92 percent between atlases. A century ago, rampant deforestation, loss of wetlands, and the virtual disappearance of beavers hurt the mergansers. We've compensated for that early nature nihilism by helping to restore wetland-engineering beavers, rebuilding lost wetlands and allowing forests to rebound, which protects water quality. Pivotal to the success of the hooded merganser are cavities, in which they place their nests. Dead and dying trees form some suitable holes, but the boom really began when people started erecting nest boxes for wood ducks. The hollow tubes worked just fine for mergansers, contributing greatly to their resurgence. Expect to see plenty of ducks, including hooded mergansers, at the 17th annual Shreve Migration Sensation in Wayne County on March 18. The event includes a variety of talks, plus field visits to the vast wetlands of Funk Bottoms and Killbuck Marsh. For details, visit www.shreveohio.com/migration-sensation. Well, back in Ohio, where the temperature will drop into the 20's F tonight, and the wind is howling. A far cry from southern Georgia and southwest Florida, where I spent the last eight days. It was pretty much a gonzo, dawn to dusk everyday, birding/photographing expedition, and a highly productive one at that. It'll take a while to sort out many thousands of photos. The trip was not without challenges. I made my first trip into the Withlacoochee State Forest, a place known for its Bachman's Sparrows and Red-cockaded Woodpeckers, among many other species. I found both, but also learned the perils of navigating the forest without benefit of four-wheel drive. My first day, I managed to stick my car but good in an undetectable soft sandy spot on a very remote forest road. That took about three hours to resolve. Also, the two days that I poked around the Withlacoochee were plagued by overcast skies and off and on rain, which made sharp, crisp photos a near impossibility. Nonetheless, I look forward to a return trip, in four-wheel drive mode. But after the ill weather of the Withlacoochee, it was mostly warm weather and sunny skies. Following are a smattering of images. 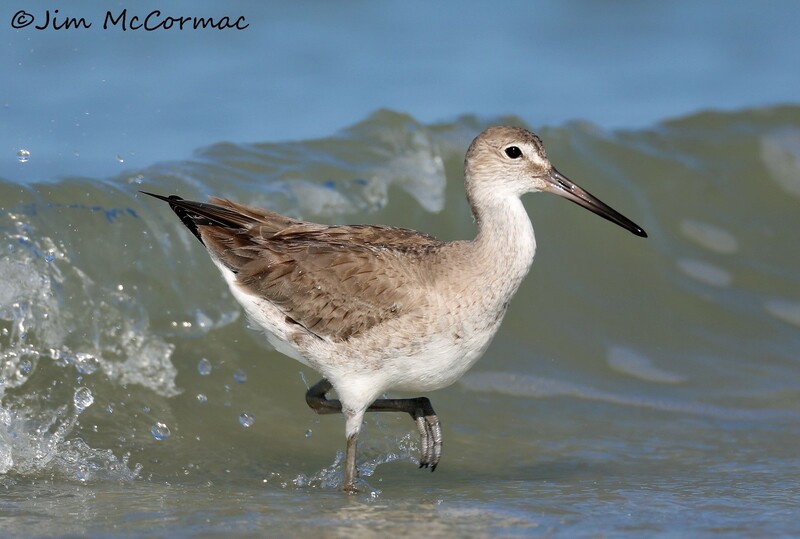 A Willet stalks through surf in the Gulf of Mexico. There are two distinct subspecies, Eastern and Western, and there is talk that some day they may be carved into separate species. This is, I believe, the Western type. These big sandpipers are quite common along the Florida coast. They look rather plain, until taking flight. Then, a conspicuous white wing stripe creates a bright burst. Another common shorebird, the Black-bellied Plover. When these birds attain breeding plumage later in spring, they'll look like a different species. Breeders have ebony underparts and snowy upperparts checkerboarded with black. Brown Pelicans are everywhere down there, and are irresistible photo subjects. Not very challenging though, whether perched or in flight. 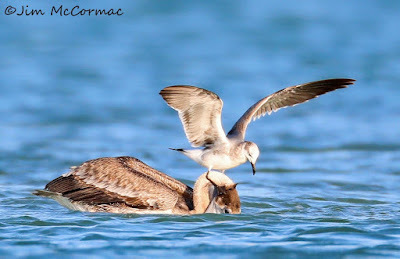 But, capturing one with a juvenile Laughing Gull perched on its head is a bit harder. This pelican had just plunged into the water for fish, and the gull instantly landed on its head, awaiting an opportunity to pilfer a morsel. 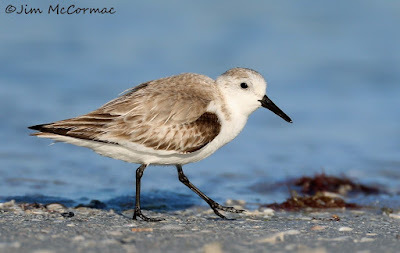 A Sanderling, the classic wave-runner sandpiper of beaches nearly worldwide. 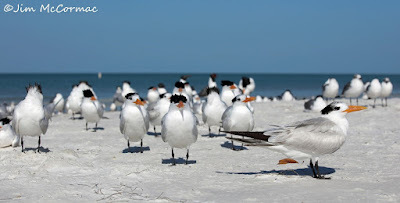 Much of the aural ambience of Florida's beaches comes from this species, the Laughing Gull. It's well-named, and being in close proximity to a flock can sometimes veer on the annoying when they began to loudly "laugh" en masse. An adult Laughing Gull, in full breeding plumage. After breeding, they lose the hood and are not as spectacular. Most gull species become distinctly handsomer when in breeding condition. The bill, legs, and orbital ring (thin ring of bare flesh around the eye) become more colorful, and the plumage brightens. 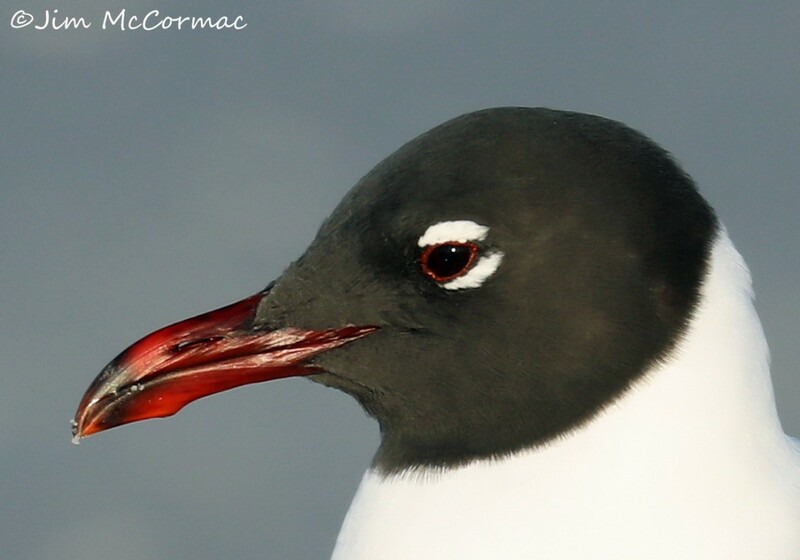 In the case of smaller hooded gulls such as this, the dark head cowl develops, too. 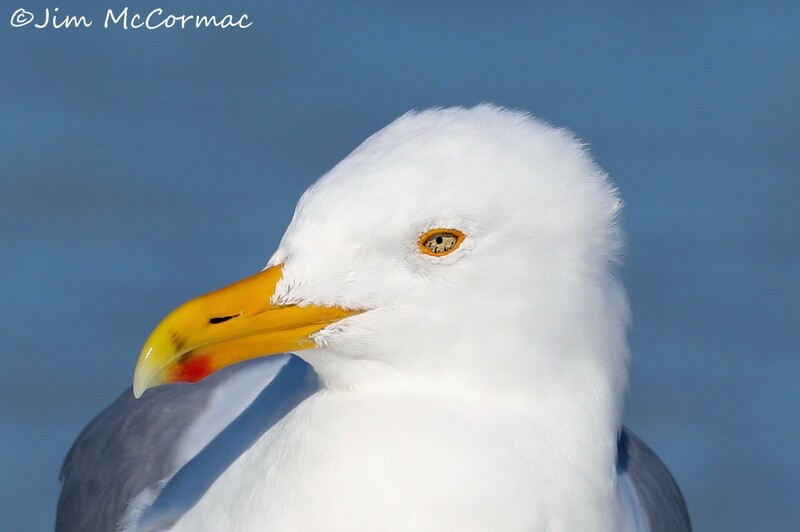 An adult Herring Gull, already in full breeding plumage. It has lost the dusky streaking on the head, which now gleams n the brightest white, and its bill and orbital ring are brilliant. A flock of Royal Terns rest on Fort Desoto Beach. 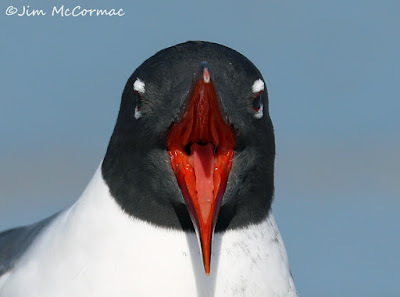 Some Laughing Gulls lurk in the background, right. I had a great time in this spot one morning. By arriving just after sunrise, one has several hours before all of the tourists arrive and the sun gets too high and harsh. A resting flock like this attracts other birds, and I photographed many species as they came and went. Also, by laying/kneeling on the sand and shooting from a low position - which yields a better perspective - the birds are less bothered. After a while, I essentially became one with the flock, and birds were all around me, sometimes within five feet. I shot this with my 70-200mm lens at 70 mm, and wished that I had brought the wide-angle 16-35mm onto the beach with me. 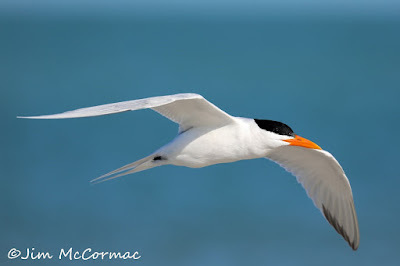 A Royal Tern in flight. A thing of the utmost fluid grace. 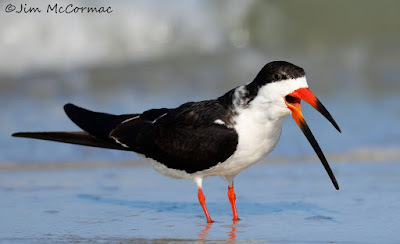 A personal favorite is the Black Skimmer, what with their strange bill and black hoodie pulled over the eyes. They use that odd bill to skim the water, just the elongated lower mandible slicing through the liquid. In this way, they are able to deftly snare small fish. Head on with a skimmer, showing a completely different dimension to the bill. You could slice off a finger with that thing! I spent several wonderful hours at the fabled Venice Rookery, owned by the Venice Area Audubon Society. The rookery is on a very small treed island in a little pond, and thus viewers are quite close to the action. Nesters include various egrets, herons, Anhinga, and ibis. Here, a nearly fully grown young Great Blue Heron begs for food from an adult. 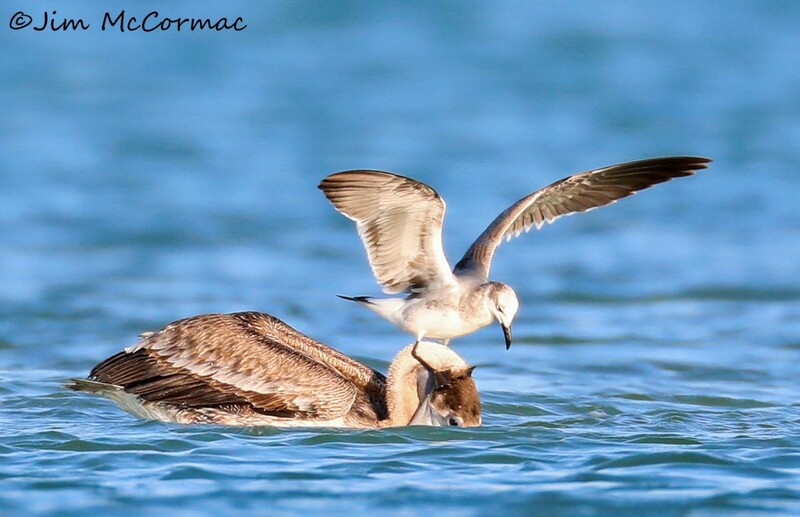 A second after I made this image, the young bird lunged upward, seized the adult's bill, and yanked it downward. This is how the young stimulate the adults to regurgitate food. Burrowing Owls next, I think.